The Lake Merritt Boating Center offers basic through advanced small boat sailing as well as year-round boat rentals. If our classes don't fit your schedule, private lessons can be scheduled. Prerequisites: Age 18+ and ability to swim Your entry into the world of sailing! A basic sailing course taught aboard 8-14 foot boats on Lake Merritt. Learn the basics of sailing - safety, boat handling, sail trim, points of sail, knots, sailing theory, crew overboard, and sailing language. Perfect for the novice or returning sailor. A skills card will be issued upon completion of written and skills evaluations. No Prerequisite. Classes held on Lake Merritt. 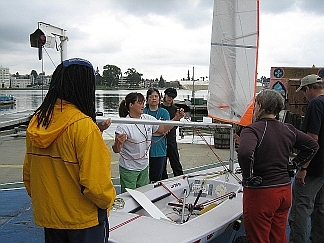 Prerequisites: Basic Small Boat (Dinghy) Sailing or Basic Keelboat Sailing or equivalent, Age 18+ Apply your basic small boat sailing skills to sail our faster Sunfish and learn to single-hand the 14-foot keelboats in this 2-day course on Lake Merritt. Skills include rigging, using your weight to trim the boat, rules of the road, and capsize recovery. Skills card issued upon successful completion of written and on-water evaluations. 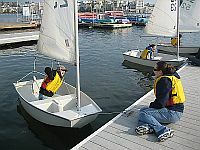 Prerequisites: Basic and Solo Small Boat (Dinghy) Sailing or Basic Keelboat Sailing or equivalent, Age 18+ Expand your sailing skills sailing at the Jack London Aquatic Center in JY-15s in this 2-day course on the Oakland Estuary. Learn how to navigate with traffic, tides, and more wind while you improve your crew work and skippering skills. Skills card issued upon successful completion of written and on-water evaluations.